I'm already making one... Ohh by the way you want a 3d R? THATS DRIFTING!! HELL YES!! what can the tommykaira do in the quarter mile? Quarter mile? You mean about 400m? The Tommykaira R in Racer 666 was mirrored as a R34 Nur in Gran Turismo 4, maxed out, it should hit the quarter mile at 9 seconds at . Did the testing few days ago. But, I'll check it again to confirm the true result. Oh.. I used forza 2 as my experiment but I didn't have any luck. Mind if you give me you Yahoo Messenger? I'd like you to see my early sketch of the R.. I did the best that I could and I modified the front bumper and the headlights not colored though! BTW, I thought Forza 2 has a Tommykaira R? Nice, only one thing though, the rims are not tilted to that extent :Xl: It's more towards vertical, and the rims, should be six-spoked, not multi-spoked. Other than that, it's all right. Do you guys know that MasterGT-R34 posted a story called Toykyo Extreme Racer: Legends after he got inspired by the Tommykaira r story by outlaw. Noticed it as well, only thing that bugs me was the non-existant paragraphs. Makes reading hard for me. 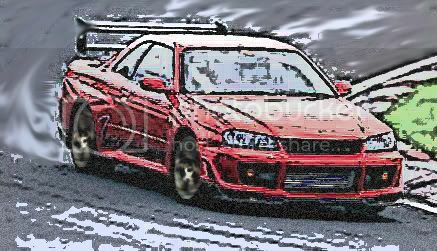 Yep, the stock image came from Forza 2's preview pics. Currently, I'm writing the 9th stage in my A4 size paper, and now in the 3rd page out of my average 6 to 7 pages. That's about 2k words. So, yeah, I'm halfway through. Not too sure when it would be done. I take my time. Rushing would only make the story feel fake in many ways. But the normal R is 8 right? Or should I just redraw the entire thing? I already colored it too. By the way I wanted camber because you said it wasn't drifting so if you check txr and wm games all their front wheels are cambered because they want to prevent drifting. In any case all the boss in txr has camber so making it that way. It makes some sense or are you suggesting to a point that you WANT to see it drifting in your manga. It's already so hard panneling how about drawing one car for each? This is getting out of hand somehow. I'll point out in point form. - The normal R has 6 spokes, not 8. Even the Tommykaira R has six-spoke rims. - Yes, it is cambered, but not to a point the camber turned out to be super-camber settings; this reduces a lot of turning ability, hence making it pointless. I'm taking all the car points from GT4, which is by far the nearest thing to a real life situation. A slight camber increases stability, and better cornering. Over cambering will result of loss of acceleration, loss of traction, hence understeering to the driver's death. - Wangan Midnight Maximum Tune is fake physics in action. Nothing in that game is true when it comes to handling physics. Heck, is it really possible to drift at 300, 280kmh? It is obviously a strict no. The only thing you'll experience is either grip, or understeer, or even sliding out of control, wrapping into a lamp post. - In TXR, yes, it maybe done with some famous drivers like Orido, but the camber sense, if have taken notice, it isn't as severe; 2 and a half degrees max. The one I took notice in your drawing had an approximately 5.0 to 7.5 degrees of camber; it's suicidal camber. - If you read the story properly, the car does oversteer or slide out of control once in a while. The battle between the Nissan Gloria and the Tommykaira R is one example. A lot of factors takes place; Tyre wear, camber settings, stabilisers. 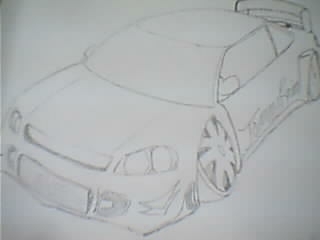 - Yes, I know it is hard to do panelling and drawing each car as it is, however, this is reality. This is how it would feel when we work under a big company; stress. Heck, I'm being pushed around by quite a number of reviewers, telling me to update Racer 666's 9th chapter. Don't think you're the only one getting the pressure. This is reality, not some kind of dream where you can get by so easily. I got flamed and ranted when I first debuted this story, and fought back, that lasted for 1 month. Anyway, I'll just cut it short, no point going on telling my tale. I'll see what I can do to get the story going again. Hehe sorry bout that.. Just wasnt in a good mood a while ago.. As I was gonna say its just a preview its just like a front shot dont worry I'll lessen the camber (Darn I always like that style) hehe... Considering the fact that outlaw 666 is better than TXR legends... 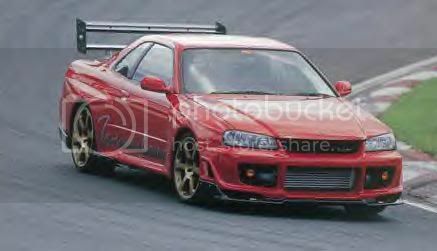 I just read it a while ago.... Why the heck will a GT type skyline (for example your tommy kaira R) go in a scrap yard!? What the heck? Is he trying to get the story of wangan?? Why the heck is Takumi's 86 there? It should be the BUNTAMOBILE for god's sake... anyways ill try to get that camber fixed..
Alright ts fixed now as well as the rims and the front bumper but I erased the colors... Hope thats alright. I'll post a pic as soon as I can. Yeah, tons of it as well. But at least I make the effort to release a chapter of any story per month, just to keep me going. Though, longest gap was a record of 4 months some few months back. Is it me or is it that Outlaw2 still angry at me?